1Ti 5:24 The sins of some people are conspicuous, going before them to judgment, but the sins of others appear later. If you are a Star Trek fan, you know that the Klingons have a device on their ships called a cloaking device. It makes the ship invisible, though just before they fire their weapons they have to turn it off. They become visible at that point, but for the skilled observer, sometimes the cloaked ship causes a kind of wavy irregularity in space as it is viewed on Captain Kirk’s screen and might be just enough to give away the enemy’s presence. But you have to be watching, carefully. The wicked expend large amounts of energy moment by moment maintaining their cloaking device – especially if they are one of the wolves in sheep’s clothing that creep into Christ’s church. Think about it. How much effort does it take to put on a disguise and keep it on, presenting yourself as someone you are not? Quite a lot. All wicked, ungodly people do this to some extent, though not always to keep their cloaking device energized. As Paul writes in Romans 1, all men know God exists and that He is the Creator, but they refuse to honor Him or give Him thanks. Instead, they suppress the truth. And that “suppressing” is like having to constantly hold down a spring lest it spring up into full view. People who cloak themselves with a disguise inevitably slip at times. Their guard drops in an unguarded moment. The “oh ever so nice” pastor snaps at someone for making a mistake. 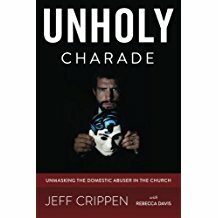 The quintessential holy saint church member scowls at his wife and speaks to her in a tone of voice you have never heard emanate from him before. The famous “christian” celebrity women’s speaker who has cranked out book after book and can’t keep up with the conference circuit she is demanded by, turns to one of her team members just before going to the podium, gives her an ugly look of disgust, then smilingly and with a saintly air walks to the podium to the adoring crowd’s applause. If you do that, you become the ally of the wicked.